Camping with Kids – How to fill the school holidays. It’s approaching that time of year now… balmy summer days and long sunny evenings. But you know what that means! School holidays! Do you need some school holiday inspiration? How about a 7 day roadtrip with the kids? Look no further! We thought we would write a little blog about all the fantastic things that Wales has to offer you and the kids during all those weeks off. And not only that, but we have also thought about wet weather options too…well how else would we have the greenest valleys? 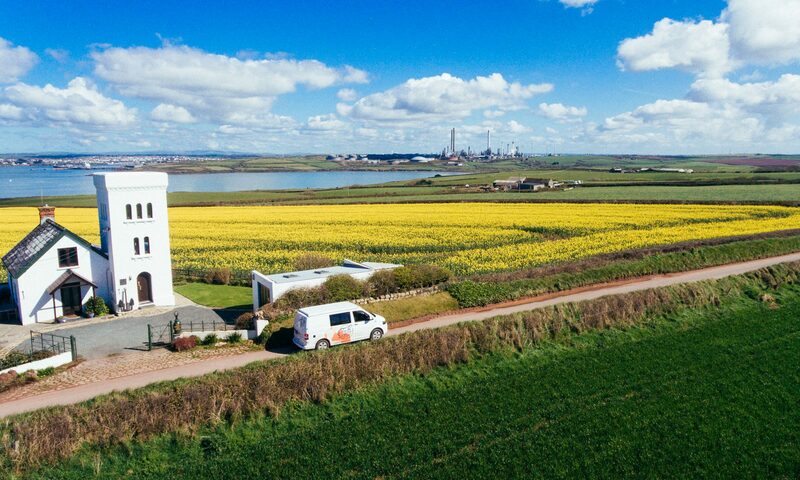 You may say that we are biased but we think that camping is the best way to spend the holidays and we know a tent isn’t for everyone so hire yourself a camper, get on the open road and explore all that Wales has to offer. In this blog we are going to feature some of West Wales but we have a few more win the pipeline for North and Mid Wales too. If you’ve read any of our other blogs you will know that we are huge fans of St. David’s and you’ll not be surprised to hear that we are going to big it up once more. It is such a great place for kids. There is a hive of activity, plenty of places to eat out and loads of incredible beaches. So here it is… 7 days in West Wales…With the Kids! Day 1 – Pontypridd to Tenby. Check out Folly Farm on the way there for 120 acres worth of animals and fun. Then spend the afternoon checking out the beautiful little harbour town of Tenby. Day 2 – Tenby to Cross Hands. Drive over the to Pembrokeshire Wake Park where you can learn how to master the art of cable wake boarding, one of the fastest growing watersports. Beginners will find it easy to learn, allowing for quick progress at an individual level and the more advanced rider is guaranteed to have their fix of adrenaline for the day, performing daring air tricks using the obstacles. Pembrokeshire Wakes Park have a variety of lessons and packages to suit every ability. Then you can explore the local woodland surrounding the Wake Park. If you’re stuck with the weather you could head over to Blue Lagoon Water Park in Bluestone National Park. Day 3 – Cross Hands to St Davids via Hangar 5 just north of Haverfordwest for the only dedicated indoor trampolining experience for both adults and children. Full of interconnected trampolines, angled walls, roll-over platforms and more. An awesome option for one of those wet weather days too. Day 4 – Now you’re in St David’s you have a huge amount of options to choose from. We absolutely love all of the TYF activities, from coasteering to kayaking and more. We can even get you a discount if you have hired a Taffi Camper. Or if you would prefer a more relaxing day why not try the Creative Cafe to do a spot of pottery painting. If you want to reign in the spending by this point there is always the absolutely stunning White Sands Beach for some beach cricket, surfing and swimming or you could even go crabbing at Porthclais. Day 5 – Ramsey Island boat trips are an absolute must do and we would highly recommend Falcon Boats for a fantastic family trip. Next up head to Porthgain for a walk around the harbour walls and most importantly for the best fish and chips we have ever eaten at The Shed washed down with a drink at the Sloop pub. Day 6 – St Davids to Aberaeron. Take a walk along a section of the coastal path in the morning before you go for breathtaking views of the coast. Then a stop at New Quay which was a haunt of the famous Welsh writer, Dylan Thomas. Have a stroll through the town and maybe even get yourselves a drink and a bite to eat at his favourite pub, The Black Lion. Once you’ve reached Aberaeron, sit on the harbour wall and keep your eyes peeled for Dolphins. Aberaeron is a beautiful seaside town with a stunning harbour and amazing pubs. We can highly recommend The Harbour Master located right on the harbour wall for excellent food, drink and a fantastic atmosphere. Day 7 – Aberaeron to Pontypridd. Spend the morning in Aberaeron before a beautiful drive back through Wales to Pontypridd. All this is sure to tire out restless kids and energise you adults for the rest of the school holidays. Stay tuned for more ideas for family holidays coming up. Previous PostPrevious Converting a Campervan – 7 tried and tested MUST DO’s to think about before you start on your conversion adventure.